Or, as the old saying goes: “In the ocean many things are hidden.” And it’s true enough. For millennia, to truly understand what lurks beneath the seas, we’ve relied on sightings through unfocused binoculars, old sailors’ stories and even a haphazard guess here and there. And ever since humans have laid eyes on the oceans, there have always been myths of sea creatures. Think of the seductive sirens. The many-headed Hydra. Even ol’ Nessie of Loch Ness. There is one mythical creature though, that’s possibly the largest ever imagined by mankind. A tentacled giant so powerful it could pull whole ships down into the watery depths of Davy Jones’ Locker. And with a name that would send chills down any mariner’s spine. Today, we see it largely as fiction, but the Kraken, rather unfortunately, is more grounded in reality than you’d think. Despite there being very few first-hand accounts of encounters with the Kraken – as most who encountered the Kraken rarely lived to tell the tale – mentions of the monster date all the way back to the 13th century. ‘The Kraken’, coming from the Norweigan word krake (meaning octopus), was first described in detail in a Norweigan educational text, where it would thus become part of mysterious Norse legend. The length of ten ships. Round, flat and full of arms. The largest and most surprising of all animal creation. That’s how the Norweigan text initially described the Kraken, which, through those muddied waters, sounds a lot like the sightings of the giant squid, a native species that can grow to an astounding 43-feet. But mystery combined with fear has a way of exaggerating what the eyes see. And through repeated sailors’ stories alone, the Kraken became something entirely different. It was now almost a mile and a half wide. It possessed huge, powerful tentacles that engulfed ships with ease. And when it was finished with the ships, the Kraken was so large it would create massive whirlpools to finish off any lucky survivors. The monster was given an almost mythological edge because after all, such tales do grow in the telling. Throughout the centuries, hundreds of unexplained seafaring tragedies have been attributed to the Kraken, and in every part of the world. A shipwreck off the coast of Sweden back in 1512. A fleet that never reached its destination in the Pacific back in the 17th-century. But one such incident was so devastating, one brand of rum made sure it will never be forgotten. Let us take you back to yesteryear, when the first-ever export of black spiced rum left its Caribbean birthplace, aboard a ship set sail for the slightly cloudier climes of Great Britain. Alas, the ship, which happened to be carrying one of the largest quantities of rum to be transported at the time, never reached its final destination. As you can imagine, the rumours were plentiful. There were tales of pirates. Reports of the worst storm the Atlantic ocean had ever seen. But there, at the back of every sailor’s not-so-sober mind, was the Kraken. 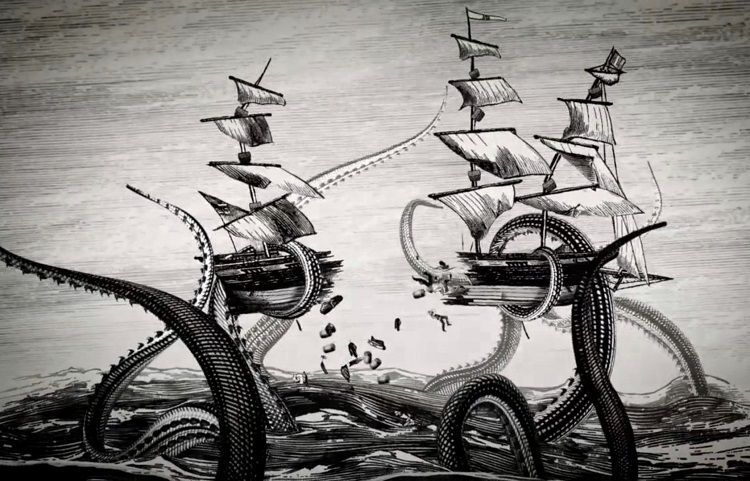 In the aftermath, it is believed that barrels carrying the black spiced rum drifted off the ship into the sea and made their way back to their Caribbean homeland, where the rum was renamed after the Kraken as a tribute to the beast’s unchallengeable power and might. And upon hearing this story, centuries later, Kraken rum was born. But it’s not just the name that resembles the monster. A rum as dark and strong as the Kraken. 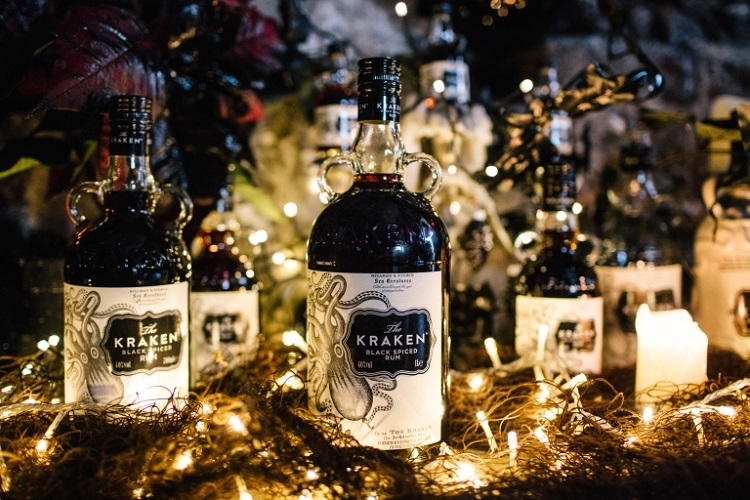 Bottled in Trinidad & Tobago, before making its voyage across the very seas where its namesake may be lurking beneath the surface, Kraken rum is definitely worth the risk. 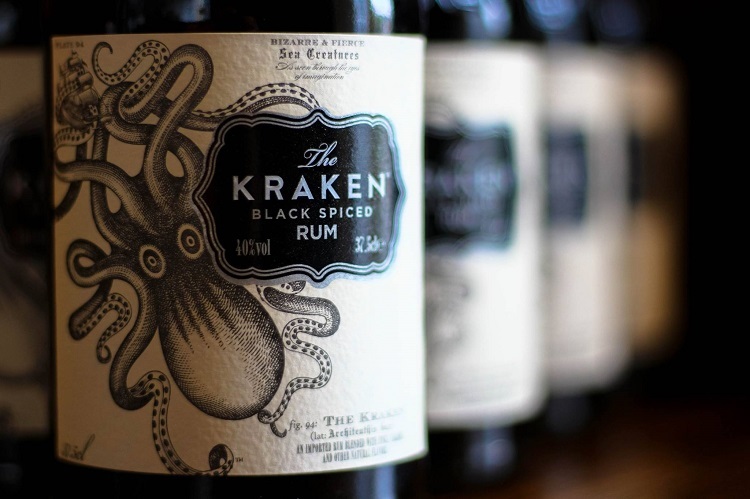 Made from a blend of 14 different spices, including cinnamon, ginger, allspice and cloves, the Kraken might have been every sailor’s nightmare – but this rum is definitely a dream to taste. Initially, there is a dark chocolate sweetness before a more full-bodied, satisfying flavour takes over, with the likes of vanilla, cinnamon and orange all layered in an extraordinarily warming, rich and rounded finish. And we simply can’t ignore the presentation. Black in colour like the monstrous inky squid that inspired its name, the distinctive double-handled bottle is a homage to Victorian-style rum bottles, where the all-important nectar would be hung on cabin walls during choppy sea voyages. So whatever you do when you’re drinking this, you’ll never forget the rum’s history. And when you’re deciding how best to drink it? Don’t be afraid to release the Kraken. When faced with a bottle of spiced rum, the most obvious thing to do might be to mix it with Coca-Cola. Or ginger beer, if you’re a bit more adventurous. But with Kraken, while it’s one of the stronger spiced rums around, drinking it neat is not nearly as frightening as the real thing. In fact, prepare for notes of fruitiness and festive spices, underneath a pleasant flavour of burnt sugar and – most importantly – the smoothest finish. It’s a complete revelation and more than that, guaranteed to alter your perceptions of spiced rum. But don’t just take our word for it, book a table and try it for yourself. Be careful though, because to not respect the power of the Kraken is to not respect the sea. So however you have it, sip your glass of Kraken rum with high regard – or prepare to face the wrath of the waves. Unless, of course, you’re strong of nerve. In which case Sailor, we salute you.